Tiger mother battles her and for her offspring. Both win, sort of. Engrossing though at times highly-strung first-person account of a mother raising her children - with sweat, tears, all. Just what exactly was the fuss all about? After reading Amy Chua's article in the Wall Street Journal, which incredibly enough, attracted close to nine thousand comments(!!! ), I was expecting some sort of an in-the-face cultural diatribe against the American (or Western) style of parenting, mated to an unalloyed gloating in the superiority of the "Chinese" style of parenting. But that is not it. At all. As the daughter of Chinese immigrant parents, the author is appreciative of the freedoms that America has provided, and has immersed herself in the American experience (she is also married to a Jewish American). "But most of me feels tremendous gratitude for the freedom and creative opportunity that America has given me." The book does excoriate the permissive American style of parenting, and those criticisms are not altogether without merit. No one would seriously take offence at someone criticizing the often lax, hands-off nature of parenting, American or otherwise, that nonetheless ends up with children growing up in a weltering pool of mediocrity, snickering at world-class achievements while still secretly envying them. Parents grant children freedom in the name of giving them "space", the children still grow up to resent their parents. But this is also a tale of angst, defeat, and often enough of a tension-filled atmosphere in the house of the Chuas. This is the story of Amy Chua, professor of Law at Yale University, telling in the first-person, the story of her two children - Sophia and Lulu - and of her attempts at instilling in them values of hard work. No, make that relentless hard work. This is the story of how her two children were trained to become brilliant pianists and violinists; Sophia, the elder, performed at the Carnegie Hall; Lulu, the younger one, was called a "gifted violinist", and the mostly overwrought, highly-strung style of parenting that Amy Chua brought to bear upon her children. All well-meaning, and the love she has for her children cannot be doubted, but a highly-strung environment nonetheless could be found in their house. This is also partly the behind-the-scenes story of her American Jewish husband, who seems to have been a calming influence on the stormy waters that Amy brings to the table, so to say, and to mix metaphors. Since enough has been written about the book - by the author, reviewers, critics, and more, after some thinking, not a whole lot mind you, I think at least some of the criticism leveled against the author draws not so much from the merits of the book or its story as much as from a resentment, to put it one way, against the author's assertions of parenting superiority over the American style of parenting. Those criticisms tend to ignore the very clear over-the-top style of writing, where it is obvious that the author is exaggerating, and not to be taken seriously. In case the reader forgets that, there are intermittent reminders. As a side note, Amy Chua gave up a Wall Street career in law to teach at Yale. Why? At the all-night drafting sessions with investment bankers, while everyone else was popping veins over the minutiae of some multibillion-dollar deal, I’d find my mind drifting to thoughts of dinner, and I just couldn’t get myself to care about whether the sentence should be prefaced by “To the best of the Company’s knowledge.” Any statement contained in a document incorporated or deemed to be incorporated by reference herein shall be deemed to be modified or superseded for purposes of this Offering Circular to the extent that a statement contained herein, or in any other subsequently filed document that also is incorporated by reference herein, modifies or supersedes such a statement. The second reason behind the hailstorm of criticisms and judgments against the book and more so against the author would be that the author is what I could call an example of a successful immigrant family that has embraced the American dream of making it big on the back of hard work and perseverance - the same traits that were extolled in America for so long and can be credited for the nation's rise to economic greatness in the twentieth century. As close to a successful experiment in social heterogeneity as may be expected. She is the daughter of an immigrant Chinese family, she herself is a successful academic, a published author, her husband is a successful doctor, and a Jew - so that is a culturally heterogenous family you have there, the children are successful in their endeavors. The elder daughter performed at the Carnegie Hall, no mean feat that. As I watched American parents slathering praise on their kids for the lowest of tasks - drawing a squiggle or waving a stick - I came to see that Chinese parents have two things over their Western counterparts: (1) higher dreams for their children, and (2) higher regard for their children in the sense of knowing how much they can take. These two reasons, in my opinion, make so many of the Americans criticizing the author feel uncomfortable - because it reminds them that hard work is a sine-qua-non for success in this world. Because the culture of hard work is actually one of the defining traits of the American nation, one that it has been known for in the world. Because somewhere down the line America chose to abandon the virtue of hard work, the Protestant work ethic, for the more profitable pursuit of prosperity via the easy route - witness the surge in interest in Wall Street and the economic catastrophe in 2008. 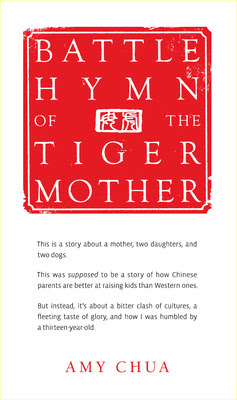 To be sure, there is much that most could find wrong in Amy Chua's parenting style. Sure. But I suspect most criticisms do not draw from that pool of indignation. Much of the mud hurled comes from the fire of envy. And does Amy Chua have the all-knowing smirk-like attitude to her writing? No. Not really. She is quite self-aware actually. Self-deprecating too. But with a tart tongue too. Sample these: "Thank goodness I’m a lucky person, because all my life I’ve made important decisions for the wrong reasons." Or "This took me aback. No one had ever accused me of trying to keep things fun." And finally, what is it about Amy's brain that so annoyed her daughter Lulu? I’ve thought long and hard about how Chinese parents can get away with what they do. I think there are three big differences between the Chinese and Western parental mind-sets. First, I’ve noticed that Western parents are extremely anxious about their children’s self-esteem. In other words, Western parents are concerned about their children’s psyches. Chinese parents aren't They assume strength, not fragility, and as a result they behave very differently. Third, Chinese parents believe that they know what is best for their children and therefore override all of their children’s own desires and preferences. Western parents worry a lot about their children’s self-esteem. But as a parent, one of the worst things you can do for your child’s self-esteem is to let them give up. On the flip side, there’s nothing better for building confidence than learning you can do something you thought you couldn't. What Chinese parents understand is that nothing is fun until you’re good at it. To get good at anything you have to work, and children on their own never want to work, which is why it is crucial to override their preferences. This often requires fortitude on the part of the parents because the child will resist; things are always hardest at the beginning, which is where Western parents tend to give up. But if done properly, the Chinese strategy produces a virtuous circle. Tenacious practice, practice, practice is crucial for excellence; rote repetition is underrated in America. Once a child starts to excel at something - whether it’s math, piano, pitching, or ballet - he or she gets praise, admiration, and satisfaction. This builds confidence and makes the once not-fun activity fun. This in turn makes it easier for the parent to get the child to work even more. This photo sends a chill down my spine whenever I look at it. So I choose not to look at it, mostly. I spotted these mangled remains of the car in 2004, while on Bannerghatta Road on some shopping errand. What got the goosebumps to bump up was seeing that the front of the car had been so completely mangled up, like it had been run through some giant pounding machine. I can only imagine with dread the accident that would have caused a sturdy car like the Ambassador (Wikipedia link) to be so crushed and mangled. And what about the driver and occupants? Chances of anyone surviving such a horrific accident are slim, to say the least. Running an intersection at high speed. This crash looks more like a side impact, judging by the second photo, so a severe side-swipe cannot be ruled out. Animals on road, causing the driver to lose control or hit an animal that sends the car careening out of control. Take your pick. There may or may not have been an idiot here, but chances that one or more were indeed involved. The light brown facade in the background is that of an apartment complex - Mantri Paradise I believe. There is a "Fabmall" department store also visible in the background. The chain went bust a few years ago, and was bought over by the Aditya Birla Group and rebranded as "More". A few weeks back Amazon had a "Sunshine Deals" (see my blog post, Amazon Kindle Sunshine Deals) on hundreds of ebooks at prices as low as $0.99, $1.99, and $2.99. That deal ended on June 15, 2011. It seems that must have been a success, because Amazon is back with a "Big Deals" sale on over 900 Kindle ebooks, at low prices, for $0.99, $1.99, $2.99, and $3.99. This sale ends in less than a week from now, on July 27, 2011. On most of the ebooks on offer, the prices are available at a steep discount off their regular ebook prices, and several clock in a 90% discount when compared with their hardcover or paperback list prices. You can browse the bestseller's list, Editors' picks, those at $0.99, at $1.99, at $2.99, and at $3.99. The highly popular book that grew out of an HBR article, Competing on Analytics: The New Science of Winning, and its sequel, Analytics at Work: Smarter Decisions, Better Results; the original tome on the Balanced Scorecard methodology, The Balanced Scorecard: Translating Strategy into Action; Congress MP and one-time UN official Shashi Tharoor's The Elephant, The Tiger, And the Cell Phone: Reflections on India - the Emerging 21st-Century Power; marketing guru and serial blogger Seth Godin's Unleashing the SUPER Ideavirus; management guru John Kotter's A Sense of Urgency, Buy-In: Saving Your Good Idea from Getting Shot Down, and The Heart of Change: Real-Life Stories of How People Change Their Organizations; Vijay Govindarajan and Chris Timble's The Other Side of Innovation: Solving the Execution Challenge (Harvard Business Review); psychologist and Harvard professor Howard Gardner's Five Minds for the Future; management guru and the propounder of the theory of 'disruptive innovations' Clayton Christensen's The Innovator's Solution: Creating and Sustaining Successful Growth; Groundswell, Expanded and Revised Edition: Winning in a World Transformed by Social Technologies; a book for aspiring management consultants - Lords of Strategy: The Secret Intellectual History of the New Corporate World; the blockbuster bestseller on time management, by Stephen Covey, The 7 Habits of Highly Effective People.